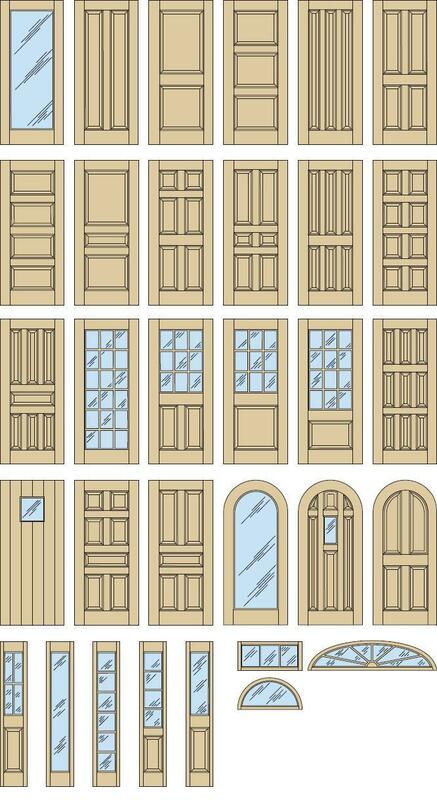 Custom Doors, Sidelites & Transoms – Somerset Door & Column Co.
One of the first things to consider when designing a custom door is wood species. African Mahogany, Red Oak, White Oak, Hard White Maple, Walnut, Poplar, Spanish Cedar, Cherry, White Ash and other wood species are available. The environmentally conscious have the option of Eco-friendly FSC Certified lumber for a “green” building project. With new construction, any door size is an option from 8 foot plank doors that are 3″ thick to arched leaded glass doors with standard thicknesses. Retrofitting existing doors impose size restrictions but certainly not style. View some of the many standard styles shown below but remember that customization is encouraged since all doors are built to order. Glass choices can be overwhelming from insulated glass with true divided or simulated divided lites to glass selections such as crackle, hammered, rain, seedy, water and other decorative options. Classic leaded glass styles with many caming options include patterned, beveled and stained glass. Our designers can offer custom designs and fabrication of the glass or the doors can be supplied without glass. Additional custom wood door considerations include finish, interior or exterior, pre-hung or door slab, design, carvings, wrought iron grills, decorative shelf, speakeasy doors with clavos, locks and hinges to name but a few. Also offered is coordinating exterior brickmould and interior casing to match your door unit. Styles vary from simple flat casing to nearly any profile. Radius and elliptical moulding are our specialty. Sidelites can turn an ordinary 6-panel door into an extraordinary entryway. True divided and simulated divided lites, wood panels and powder coated wrought iron grills are a few options for the design of your elegant entry. Many of the customization options available in the creation of the door are also available for the sidelite. Exceptional design begins with your ideas. Like jewels in a crown, so is the transom topping a stylish doorway. Custom designed transoms are usually associated with the most lavish and extravagant homes. Arched transoms sometimes as high as 20 feet bring a truly grandeur entrance to life. Spider web and sunburst transom designs are simulated divided lites but true divided styles befitting a historical reproduction are offered. The key in custom transoms is custom. Door sills include aluminum adjustable, ADA, interlocking in bronze, brass or mill finish. Mahogany adjustable and fixed sills are manufactured in house and can be custom made to any width with other wood species also available.